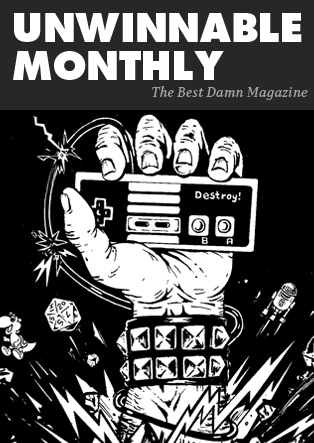 This is a reprint of the letter from the editor in Unwinnable Monthly Issue 99. You can buy Issue 99 now, or purchase a monthly subscription to make sure you never miss an issue! Welcome to 2018! I hope the holidays treated you well. Here at Unwinnable, we’re ignoring the dreary winter by writing some fantastic stories for ya. Let’s see what we’ve got. 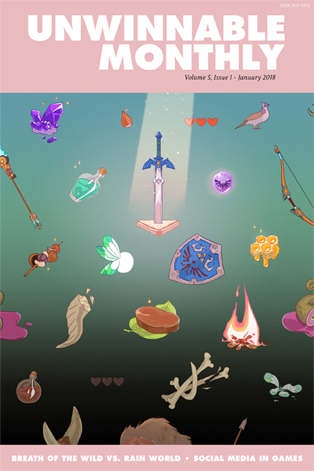 Our lovely cover art this month is by Molly Stanard and it matches up with Yussef Cole’s feature on Breath of the Wild, Rain World and what both games say about our real world’s imminent environmental collapse. Denis Farr delivers our second feature, this one on social media in videogames such as Tacoma and Killing Time at Lightspeed. Our sponsored feature is a Q&A with Olly Bennett, one of the fine folks behind the intriguing 2D stealth game The Siege and the Sandfox. Finally, Molly is also our Artist Spotlight this month, so check out more of her work there. Gavin Craig talks Mass Effect: Andromeda and the nature of endings. Which is appropriate, as Gav is expanding Backlog to tackle all stories in the future, not just games. So long, narrow focus! Speaking of farewells, we bid Casey Lynch and Battle Jacket bon voyage after 24 amazing columns on the latest and greatest heavy metal. Fear not, though, heshers, Astrid Bugdor is taking up the mantle with a new metal column: The Usurper. It’s a little more freeform and a little more blackened and we hope you dig it. Megan Condis checks out a documentary on sugar and finds it unfulfilling (pun intended, sadly). Brock Wilbur revisits the videogame sequel to John Carpenter’s The Thing and finds it . . . transformed (pun also intended – I’ll stop now). Deirdre Coyle hangs out with April Ryan from The Longest Journey and deals with some awkward questions. Corey Milne checks out a first person shooter set in Vietnam by a Vietnamese developer. Fresh off a year of telling us more than we ever wanted to know about Twin Peaks, Matt Marrone tells us more than we ever wanted to know about his son’s favorite cartoon: PAW Patrol. Which is a good place to pause and take a breath. Oh crap, I punned again. Sorry. Yussef Cole, in a bid to take over the magazine, muses on how Assassin’s Creed: Origins handles two of its villains who happen to be women of color. I muse on the magic and magick of Gorogoa. Sara Clemens’ column this month needs no introduction from me: just go read it. Rob Rich lays out how many perceptions of how things work in the games industry are flat out wrong. And Jason McMaster wraps it all up with a conflicted review of the board game Through the Ages. The last week of 2017 at Unwinnable was devoted to celebrating the best of culture in our annual top ten lists. Our Can You Hang? Challenge, based on the best music nominations, is ongoing through the end of January. You can find all our Best of 2017 stuff here. Kickstarter backers, I have been packing up the last of the rewards all week and they should be hitting the mail in the next few days (I know: late, late late). If you’ve moved and haven’t updated your address, do it noooooow! We have some new stuff rolling out in the next few weeks that you might want to check out. On the site, look out for our Lineal Game of the Year, which is a novel take on videogame history we’ll be compiling weekly over the next year. All our digital Kickstarter rewards will be up for everyone to enjoy sometime next week. We’ve got new podcasts in development, a newsletter, maybe a new publication, streaming and more. Keep your eyes on Unwinnable.com for more! Lastly, my Vintage RPG project looking at the art and history of tabletop roleplaying games, is going strong. You can check it out on Instagram or Tumblr, depending on your preference. This week is all about Dark Sun. Next week is going to be Call of Cthulhu (probably). That’s it for now. Keep warm and I’ll see y’all in February!